Utforsk fjellene og daler på Bakuriani Ski Resort på denne terrengkjøretøyturen fra Tbilisi. Drift i sommer og vinter, kjør enten en tradisjonell ATV eller en Snow Doo gjennom det tøffe terrenget for episk utsikt. Traf gjennom Tstskhratskaro passerer til Tabatskuri innsjø, hvor du vil ta en pause for en grillet lunsj. My partner and I booked this trip off season in November and Tsotne and his team went out of their way to accommodate us. Tsotne keep us up to date so we knew what to expect on the ride. So welcoming and the guys even let us borrow their gloves when ours weren't quite warm enough during the ride. Vaska was a fantastic guide you'll be lucky to have him as your guide and put up with all our questions and coffee stops. Not only was the scenery beautiful but also included a fantastic home cooked meal! Highly recommend this trip and these guys - great, great memories. Thank you guys! 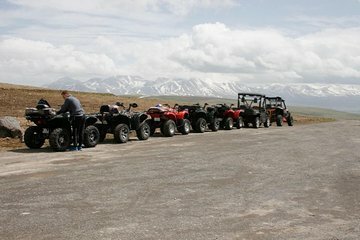 I booked the tour for quad bike ATV tour for my family 2 adults and 2 kids, on same day I received an email from the team informing us that because we are in mid-December it would be better to swap the quads with snow doo. We followed their recommendations, and here how it went. We spent one of our BEST full-day tours EVER. They picked us up from the hotel very early in the morning, they prepared for us fruits, sandwiches and drinks. We drove around 2 hours till we reached Bakuriani mountain. The group leader who drove us was driving the car very cautiously and safely in this weather, he was kind, fun, respectful and a real gentleman. After we reached there, we met a team of another 4 gentlemen who were supposed to accompany us. So it was a team of 5 instructors accompanying my family of 4. 1 dedicated for each and a group leader. Before we move, they got us prepared with face masks, goggles and helmets. The weather was cooler than we expected, although we were dressed in thermals and gloves, our gloves were not thick/thermal enough. They lend us their own gloves that they were wearing and when we felt embarrassed because this will let them feel cold, they insisted and told us we are used on this weather and all what we care for is to make you happy! .. they carried our camera to take us pics, they even carried our backbag to comfort us! this was extremely nice gesture and overwhelming. We started our journey and it was literally EPIC. The mountains and nature was breathtaking. They were ensuring keeping us safe all the time, specially the kids. Although there were some challenges on soft snow and hard slopes, yet we werent worried at all. It even added to the fun! We cruised, we played, we ate and had loads of fun till sunset. They dropped us back to our hotel with unforgettable experience and good memories engraved for both us and our kids. Me and family are THANKING you big time for such great time. Professionals like you who loves and care for their business for the best benefit of their customers deserve each and every recommendation. Well definitely come back to you and recommend you to all our circles of connections.